In the Peruvian summer holidays (January and February) 110 to 160 teachers give up their holiday to attend the free six weeks of English classes held by the volunteers. Volunteers teach in pairs, preparing lessons with detailed plans and delivering them together. The Ministry of Education officially supports this project by signing each certificate that is awarded to the teachers after they have completed the six week programme. In January 2014, the Regional Director of Education, Edgar Ochoa Pezo, came to visit the project to show his support for the programme. Both volunteers and the teachers benefit from this programme: the volunteers leave with a huge confidence boost from teaching in a classroom and a unique experience in Peru that touches the lives of thousands of students; and the teachers leave the course with improved English, new classroom techniques and knowledge that they can impart on their students. The final beneficiaries are the young students who will be taught by teachers with a greater knowledge of the English language. This subject is particularly important as the region is dominated by tourism. 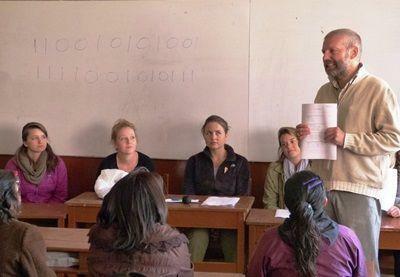 Read more about Teaching in Peru.